It is a great pleasure to join you this afternoon at this important event co-hosted by the Chinese Embassy and the British Council. We are gathered to celebrate the founding of the China Network. On behalf of the Chinese Embassy, I would like to extend my warmest congratulations to the China Network and all those who have studied in China. This is an inaugural event for the Generation UK-China Network. It represents a most valuable initiative to expand the people-to-people exchange that is growing rapidly between China and the UK. I remember attending the Forum on Forty Years of China-UK Student Exchange in November 2014. Back then, we reviewed the China-UK student exchanges in the past 40 years. Together, we summarised the achievements and experience we have gained. Today, the founding of the China Network marks our latest progress. This is the natural outcome of decades of student exchanges between China and the UK. There could not be a better time to form such an organisation. I firmly believe that the China Network has a most active and key role to play as China and the UK embark on a ‘Golden Era’ of relations. Let me share with you my thoughts about the importance of the launch of the China Network. 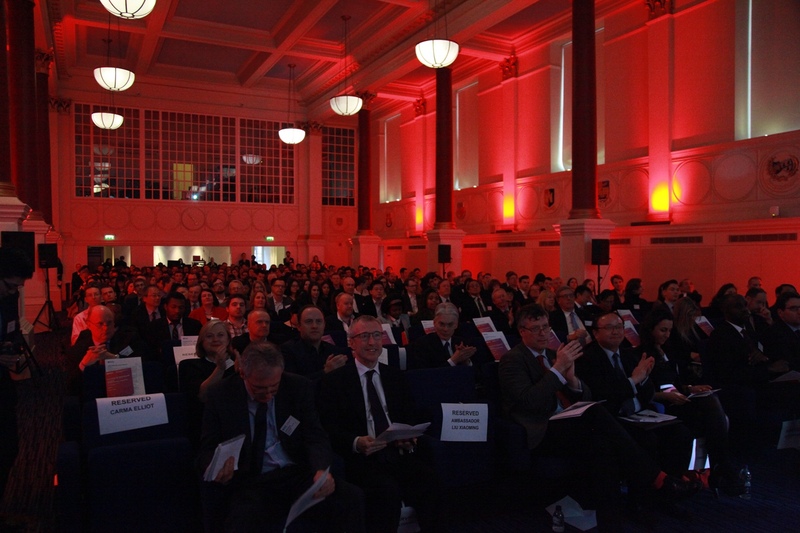 · In the past 40 years, more than 450,000 Chinese students studied in the UK. · Over the same period about 35,000 British students have studied in China. · At present, there are around 150,000 Chinese students in this country. As a destination for Chinese students, the UK is No.2 in the world and No.1 in Europe. · China is also a major destination for foreign students, ranking third after the US and the UK. · Now more than 377,000 students from around the world study in China. · Of them, 7,800 are from the UK. · The Chinese Government Scholarship scheme. · The Confucius Institute Scholarship programme. Notably, many new forms of student exchanges have been adopted. In addition to the traditional degree programmes, the tailor-made short-term study programmes have become a prevailing trend among the British students going to China. Of course, the Governments of our two countries continue to play key roles through national scholarships. At the same time, Chinese and British enterprises, universities and colleges are getting more and more involved and starting to support student exchange and internship. In March 2015, the University of Sussex announced a £750,000 China Internship Scheme. This aimed at financing 300 British students for work and internship in China. The Huawei UK launched the ‘Seeds for the Future Programme’ in 2011. More than a hundred British university students have benefitted from this programme by attending Chinese language and culture courses, and learning about doing business in China. Let me turn to my second thought about the importance of the China Network. I believe it has a vital role to help facilitate the implementation of Chinese and British government policies with regard to student exchange. Last September, Vice Premier Liu Yandong and Health Secretary Jeremy Hunt co-chaired the Third Meeting of the China-UK High-Level People-to-People Exchange. During the meeting, the Framework for Strengthening China-UK Partnership in Education was signed to enhance our cooperation in this field. Under this framework, our respective flagship projects, the Study-in-China Scholarship and the Generation UK, are now major platforms for British students planning to study in China. The Generation UK is an important part of the UK’s international strategy in higher education. Through this programme more than 80,000 young British will have studied or worked as interns in China by 2020. Last October, President Xi Jinping paid a ‘Super State Visit’ to the UK. In the Joint Statement issued during the visit, both China and the UK are committed to stronger cultural and educational connections. This means more people-to-people exchanges especially for young people, and greater facilitation for students. I expect the China Network to grow in scale. In turn, I am sure that more and more young British students will follow your footprints and take advantage of the opportunities to study in China. Let me give you my third point about the China Network. 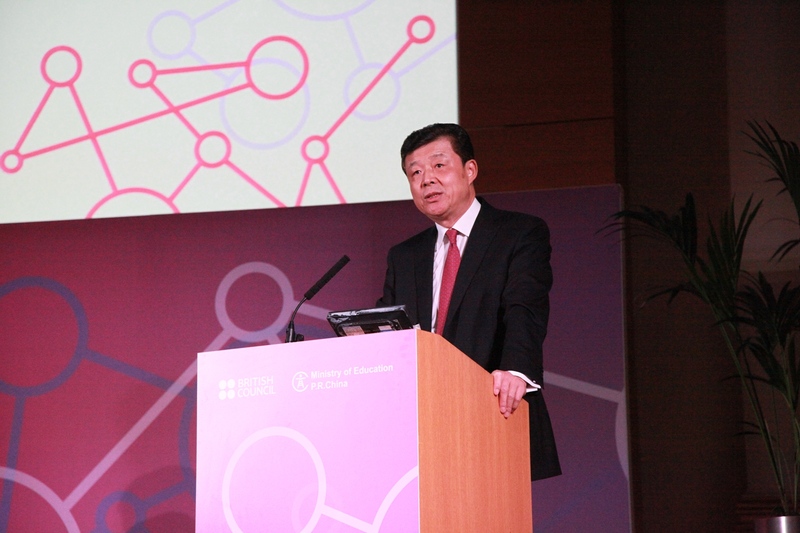 It will have an active role to play in building the ‘Golden Era’ of China-UK relations. China will soon begin a new journey, with the adoption of the 13th Five Year Plan for economic and social development in the coming five years. China and the UK are also beginning a new journey, with the building of a ‘Golden Era’ in our bilateral ties. We have before us a promising future and huge opportunities. Much can be achieved when China and the UK work together. · We can engage each other in all-round cooperation in the political field, in business and finance, in cultural exchanges and on global issues. · We can dovetail our respective development strategies. For China this includes China’s Belt and Road Initiative, the Yangtze River Economic Belt and Made in China 2025. For Britain there is the National Infrastructure Plan, the Northern Powerhouse and the UK Industry 2050. · We can step up our cooperation in emerging industries, especially in new energy, smart city, bio-pharmacy, innovation and e-commerce. All these areas will open up wider space for our educational exchanges and cooperation. 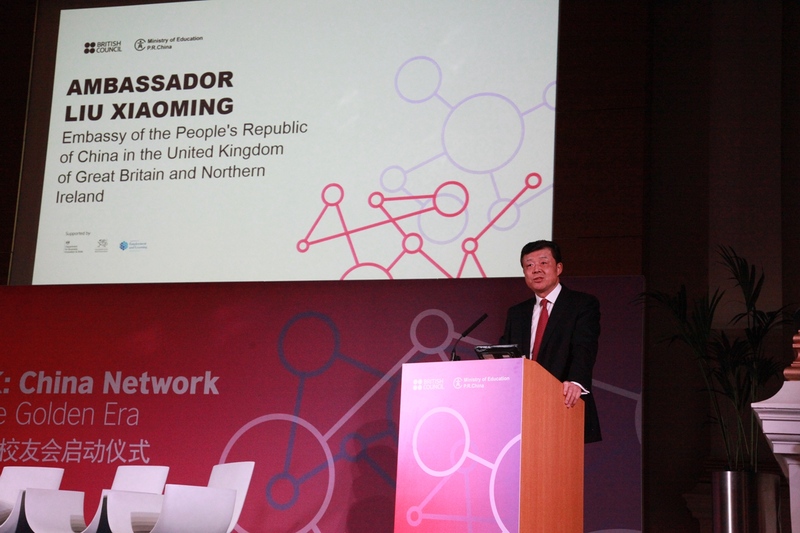 With the China Network set up today, I hope that young Chinese and British students will pool their wisdom and strength, and work together to create a more splendid ‘Golden Era’ of China-UK relations. I want to congratulate you once again on the founding of the China Network. I also hope to encourage more British students to study in China. To follow up my congratulations and encouragement, I have brought you a special gift today. This is the Short-term Chinese Government Scholarship Scheme. The scheme is the first of its kind for UK students. It will run in parallel to the long-term Chinese Government Scholarship and the Confucius Institute Scholarship. In the academic year 2016-2017, this short-term scheme will fund 150 British university students for two-month study or internship in China. Meanwhile, Chinese and British universities are encouraged to take advantage of this scheme through flexible and diverse forms of exchange programs. I am sure such an initiative will definitely boost China-UK educational cooperation and help increase the communication and friendship between the young people of our two countries. “If you want one year of prosperity, you grow grain. If you want ten years of prosperity, you grow trees. If you want one hundred years of prosperity, you grow people. If you want a thousand years of prosperity, you grow relationships between peoples”. He said this to highlight the importance of China and the UK working together for one thousand years of lasting friendship. This is actually what we are doing today. We are planning for a hundred years - even a thousand years of China-UK relations! So, let us join hands together to build this great China-UK edifice by growing people and by growing the relationships between our two peoples.